Federal documents obtained by Jalopnik through a Freedom of Information Act request support today's conclusion by the federal government and what we've said all along: unintended acceleration events, like the infamous "Runaway Prius" were not caused by electronic boogeymen. 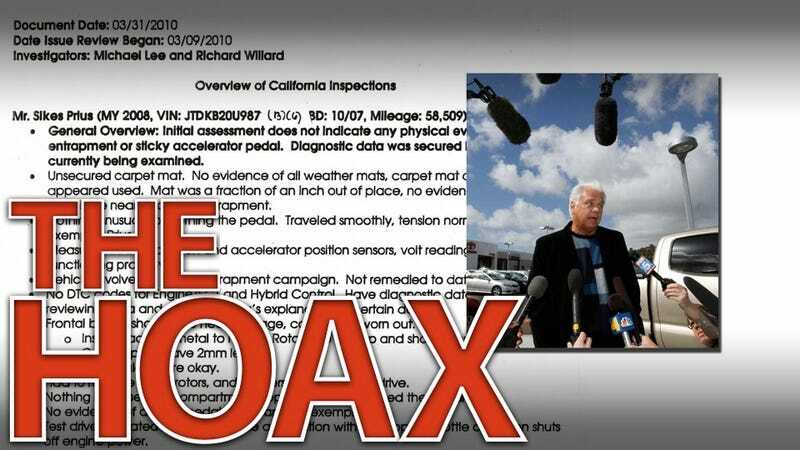 At the height of last year's "unintended acceleration" fever, a driver in San Diego named Jim Sikes made headlines when he called 911 claiming his Prius was out of control for 38 miles and required help from California Highway Patrol to stop his murderous Prius. The tape of him freaking out made national news and added to the paranoia surrounding Toyota vehicles. While appearing on national news he told a story we were skeptical of and, upon research, we discovered Mr. Sikes declared bankruptcy twice and had a very shady past. Sikes never admitted he'd faked the incident, but the National Highway Traffic Safety Administration (NHTSA) investigated and said they'd found no evidence of a malfunction. Shortly after the events Jalopnik filed a Freedom of Information Act request in order to obtain the documents from this investigation. Approximately 11 months later we received them, and after rifling through hundreds of pages of analysis, we came to what NHTSA and the Department of Transportation said today after its thorough study: there's no proof of any electronic error. This was primarily a case of people who lack proper driver's education pressing the wrong pedal. In every way, this was Toyota's beige-ification of cars biting them back, and hard. While the release of today's study indicates there is the possibility of pedal entrapment and sticky pedals (both previously known incidents), there's no evidence of either situations occuring in the case of Mr. Sikes. Images from the investigation show the floormats were in their proper place and, after recreating the journey, they couldn't find a similar flaw with pedal stickyness (nor is this an issue for his Prius model). Initial assessment does not indicate any physical evidence of pedal entrapment or sticky accelerator pedal... Test drive conducted, same route as Sikes incident. Could not simulate runaway situation. Further, the California Highway Patrol report places the time of his high-speed journey at 23 minutes, whereas it only took NHTSA engineers 21 minutes driving a steady speed of approximately 75 miles per-hour to cover the same distance. What the tests and evidence seem to indicate is that Mr. Sikes was repeatedly on the brake pedal as the car was moving forward, but not because the car was moving under its control but under the control of Mr. Sikes. Bloomberg believes the total cost of the Toyota recall campaign will be upwards of $2 billion, assuming people ever forget images of smashed Toyotas and Mr. Sikes recalling his scary, but almost certainly exaggerated, journey. Today's report from the DoT and NASA only confirm what NHTSA was able to conclude in their own on-the-scene study a year ago about the causes of unintended acceleration, namely that outside of a physical problem with the vehicle there's no magical radiation that causes these incidents. Either the driver makes an error or, as increasingly likely in the case of the bankrupt Mr. Sikes, makes up a story.